Non-fuel sales represent an important form of revenue for forecourt retailers globally. 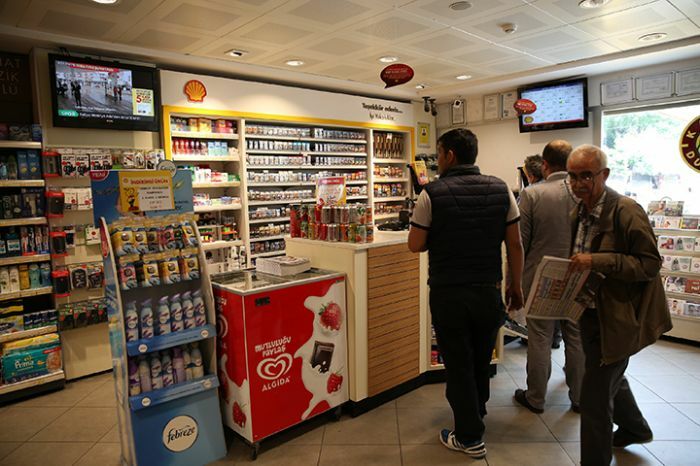 Shell is using digital media partner Linova in Turkey, to improve the financial return on its fuel forecourts by installing an in-store digital signage network powered by BrightSign. The network, which promotes Shell’s own offers and carries paid third party advertising, is currently installed in 400 Shell petrol stations in Turkey and is being rolled out to a total of over 1000 locations nationwide. Fuel forecourts are increasingly viewed as convenience stores, both by motorists as well as residents living close to stations in urban areas. Global oil giant Shell operates national networks of filling stations in a large number of countries worldwide. Shell is highly focussed on providing customers with the best possible experience, which includes the use of technologies like in-store digital media. In Turkey, the company invited digital media specialist Linova Digital Medya Teknolojileri A.S. to propose a business model based on digital signage to increase the income generated by its network of forecourt stores nationwide. The stores sell a wide variety of items including convenience food, confectionery, tobacco products, DVDs, and motoring essentials such as lubricants and tire chains. Linova offered several suggestions, which ultimately evolved into the Shell Digital Media Network following several meetings with Shell executives. Shell commissioned Linova to design, install and setup the network, including selling advertising airtime and publishing the content. Linova also works with the advertisers to ensure the content is produced according to guidelines and delivered at the right time for publication. BrightSign offers the BrightSign Network as either a subscription-based hosted networking service, or as the BrightSign Network Enterprise Edition for customers seeking to offer their own hosted service. Both provide comprehensive network management, reporting and administration tools, with support for scheduling, remote content and firmware updates, and permission-based user access. Linova has a five year contract with Shell Turkey for the Shell Digital Media Network, which covers 24/7 continuous broadcasting assurance and technical support to all locations across the country. “We decided to host the content on our own servers, which is cost-effective and gives us complete control. To do this, we adopted the BrightSign Network Enterprise Edition. We were able to choose the solution that best-met our needs, and that allowed us the greatest flexibility to work with Shell and its advertising partners to deliver the best return on their investment in digital signage,” says Tolga Sözen. The Shell Digital Media Network comprises two elements: the Shell TV Network, and the Shell LED Screen Network. Each network carries Shell’s own content, presenting news and offers from the company, and also carries advertising from partner companies who pay for time on the channel. The Shell TV Network connects LCD screens of sizes from 32” to 47”, located in over 350 stores nationwide. Among these stations, 40 prestige locations directly owned by Shell use The Shell LED Screen Network as well. These have three different sizes of LED screens strategically positioned so that every driver entering the station as well as every pedestrian going into the Shell shop can see the content. In total, the first phase of the project has involved connecting over 390 screens to the two networks, all using BrightSign digital signage media players. The Shell Digital Media Network went live in less than 12 months after the plan had been approved. Following successful delivery of the first phase, Shell and Linova plan to roll out the BrightSign Network to more filling stations across Turkey. The next 12 months may very well see the Shell TV Network expand to 1000 forecourts across Turkey making it the biggest out of home digital advertising network in the country by far. “Choosing BrightSign has proved critical in delivering this project on time and on budget, and will enable us to meet all goals for the full duration of the contract,” concludes Linova’s Tolga Sözen.